Looking for a crowd-pleasing starter for your next party? 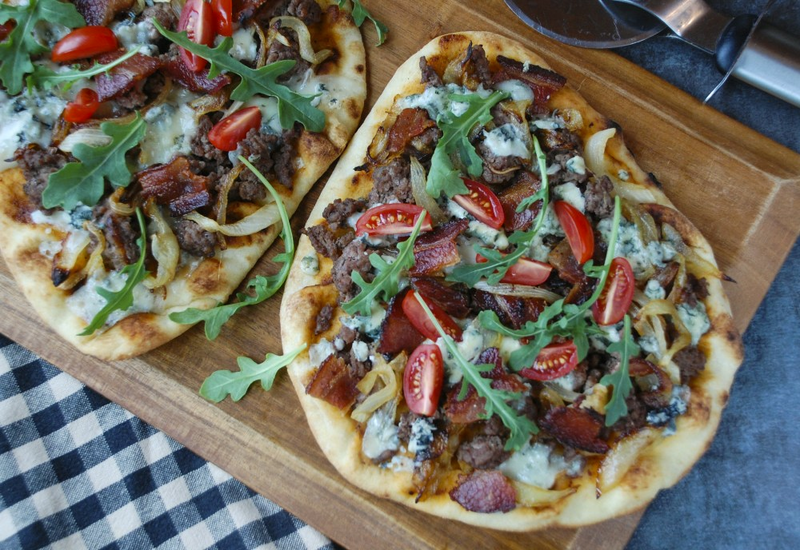 These flatbreads are like a mash-up of cheeseburgers and pizza in an easy-to-eat, finger food form. They're simple to make for a group and people go crazy for them. Probably because they're piled on with everyone's comfort food favorites. The key is the sweet, caramelized onions. 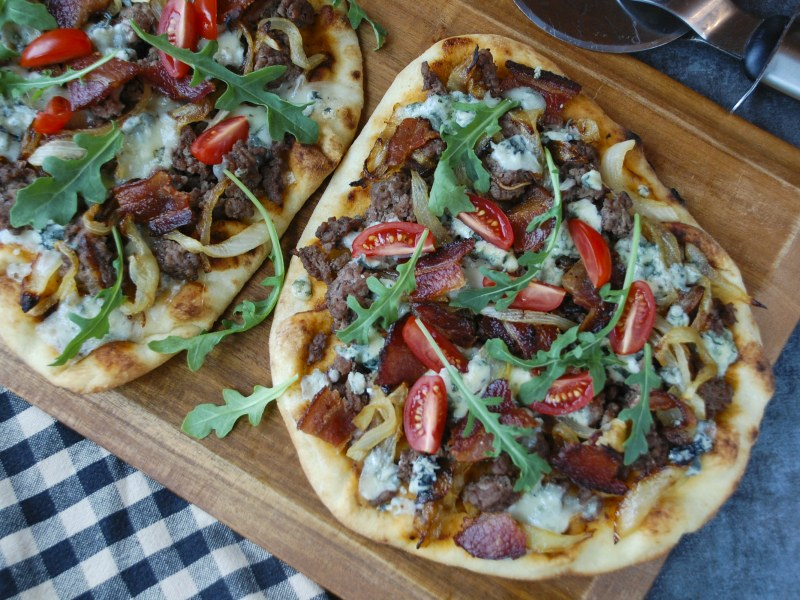 They're so good with the smoky bacon and salty blue cheese. But be warned: Guests will be bum-rushing you as you pull the next batch out of the oven! We're not going to lie: Caramelizing the onions takes some time but the good news is this can be done ahead and held in the refrigerator until needed. Bake the flatbreads right on the oven rack to make the bottoms nice and crispy. If you're not a fan of blue cheese, feel free to sub in another kind, like cheddar or Swiss. Per Serving: 426 calories; 20g fat; 34.6g carbohydrates; 25g protein; 62mg cholesterol; 788mg sodium. I am obsessed with blue cheese, especially on my burgers. This flatbread version was super fancy, but in a good way. It's the perfect dish to serve at parties when hosting! 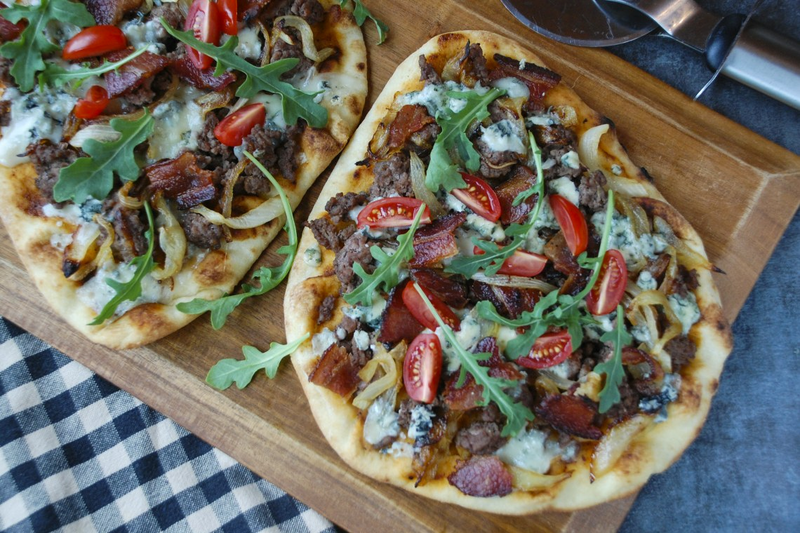 You had me at bacon and blue cheese! Two of my favorite ingredients in the form of a flat bread! Super good cheat day meal. Me and my husband grub on these all the time.